Sime Darby Oil Palm Plantation in Grand Cape Mount County, Liberia. By Edwin G. Genoway, Jr.
Monrovia — The man, who is reportedly seen in the controversial video being tortured and later became missing at the Sime Darby Oil Palm Plantation in Grand Cape Mount County, has surfaced. He's been facing queries from the Liberia National Police (LNP). The man, identified as John David, was captured in a video trending on Facebook being tormented by men believed to be security officers of the Sime Darby Oil Palm Company. In that video, David is handcuffed, at the same time with a palm bunch on his head while being tortured. One of the securities in the video is heard asking for a digger and a shovel to bury David alive. When the video became viral on social media, Liberians at home and abroad began calling on the government to arrest and bring the perpetrators to book. Some also called for the plantation management to answer questions about the inhumane act meted against this Liberian and possibly others. But the man believes to be in the video, John David, is currently in police custody. The LNP has been asking him to explain his ordeal. Police spokesman Moses Carter told FrontPage Africa that the video is factual, and a statement has been taken from David and others involved in the saga. "Yes, the video is factual; the victim John David is still alive. We have taken statement from John who was seen being tortured in the video. He's from Dama Town in Grand Cape Mount County and he's 27 years old," he explained. The Police spokesman disclosed that the incident occurred on the first Friday of February 2018. Carter expressed his displeasure with the treatment of Liberians on the plantation as is seen in the video. "It is unacceptable for our citizens to be treated in that form and manner; the police will not rest until all of the perpetrators are brought to book." According to the police spokesman, John David is not dead as was been insinuated on the social media. Carter also disclosed the name of another 33-year-old Liberian in police custody identified as Mark Gibson, who was also allegedly tortured by Sime Darby Security. Carter noted that the police also have in its custody the current head of security of Sime Darby, Boima Feakai, who was also captured in the video. He said Mark is also from Dama Town Bomi County. The two victims are from two different towns bearing the same name but in two different counties, Cape Mount and Bomi Counties. The two victims in an interview with FrontPage Africa confirmed that they were both tortured differently in different locations. 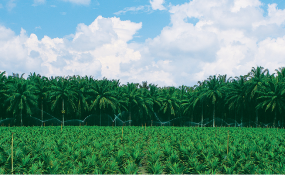 The man reportedly captured in the video said he had to illegally harvest Sime Darby's palm for survival since the company had refused to pay him. He told FrontPage Africa that he has been working with the palm company for more than eight months as a contractor without pay. "Yes, I cut the palm and they caught me with it. I did that because I was hungry and needed to buy food. I have worked for the company for more than six months as contractor without paying me," he said. "When they saw me with the palm, they started beating me and I told them the truth but they were still flogging me. They put me in the car and said they were going to bury me alive after beating me and I was not to myself but I can remember running away from the car into the forest where I was sleeping with the handcuff on my hands," he explained. Surprisingly, according to David, after he escaped in the bush through the help of Boima Feikai he felt asleep in the forest, but when he opened his eyes the next morning there was no handcuff on his hands. According to him, he doesn't know up to today, who un-cuffed him. The other victim, Mark Gibson, claimed he has no link with Sime Darby and has never worked with the company, but he was caught in the bush by the securities of the company when he (Mark) was brushing his farm. "I only saw them around me and they caught me and started asking me about palm, I told them I did not steal any palm, but they grabbed me and started beating me like I stole. They took me to the town in handcuff and kept beating on me," he explained. The current head of the Sime Darby security guards, who is in police custody, Boima Feikai, described the video on Facebook as blackmail from his predecessor, Thomas Walker. According to him, the video on Facebook was done over four months ago under the regime of Walker. He noted that when Walker and his men were on patrol in the palm farm, they caught John David with the palm, something he (Feikai) confirmed prompted the tortured of David. Feikai explained furthered that during the torture of David, Walker, who was the security manager gave his (Walker's) phone to one of the guards to do the recording while David was being tortured. "I was not in charge as security head at the time when David was tortured. It was Walker, who released the order to his men to do that to David." Feikai, who has been in police custody for more than 48 hours, told this newspaper that after the incident with David and Walker, the management of Sime Darby suspended Walker for time indefinite. He said upon the suspension of Walker, the management then promoted he Feikai as security manager to take over from Walker while serving the suspension. Feikai noted that Walker decided to now post the video on Facebook to blackmail him and tarnish the name of the company since management has refused to reinstate him (Walker) as security manager for the company. Feikai also told FrontPage Africa that it was during the regime of Walker all of the atrocities were committed on the plantation, adding, "Walker recruited about 26 men as backup to Sime Darby security and it was these men who tortured David." He further said he was the one who helped David to escape by telling him (David) to run, "If you watch the video you can hear me telling the guys to stop beating David, this guy only released this video to give me bad image." He, however, accused Bomi County Senator Sinoe Johnson of being the one behind the protection of Walker and advocating for Walker to be reinstated by the company. Feikai also noted that Walker is currently protected by the General Manager of the company because according to him Walker is the brother in-law to the British manager. "Yes, he's the brother in law to the manager so he is being protected, and his kinsman is Senator Sinoe Johnson, who is really influencing this case in favor of Walker. In my presence Senator Johnson said Walker should be reinstated and if he's not myself will not work," he explained. A civil society activist from Bomi County, Charles S. Brown, has called on the Liberia National Police to include in their investigation Thomas Walker, who name is being in the middle of the investigation. Brown said it will be fair enough for the police to do the right thing by inviting Walker and the company's manager for questioning. "You cannot keep one person in custody and allow the other person to go scot free. We must do the right thing," he said. FrontPage Africa has gathered that currently there is a split between the general manager, who is a British national, and the Malaysian employees. The split is reportedly being created because Thomas Walker is the alleged brother-in-law of the general manager and was suspended by the Malaysians while away on break. The Malaysians reportedly suspended Walker for his alleged involvement in David's torture. In a release, the company tried to distance itself from the allegation of torture, clarifying that the theft happened at Nimba Point in January 2018. Those involved in this incident are not employees of Sime Darby Plantation Liberia with the exception of Boima Feikai, the release said. "Upon discovery of this incident, SDPL has taken immediate step by suspending its Chief of Security, Thomas Walker. Boima Feikai, the personnel that was allegedly mistreating John David, the thief that was caught stealing FFB at Nimba Point has surrendered himself to Liberia National Police (LNP) for further investigation," the release states. The company claims it does not condone any use of physical force and ill treatment by any of its employees even to those caught stealing FFB. "Anyone caught stealing FFB will be handed over to LNP and SDPL will fully cooperate with the authorities on investigations undertaken by LNP."